← Harlan Ellison’s WEB OF THE CITY coming to HARD CASE CRIME ! A man’s body is found in the River Derwent in Derbyshire, presumed drowned until the autopsy reveals he has no lungs. Another corpse is dredged up in Shardlow Gravel Pit, the victim’s internal organs removed, except for his heart. Four Derby College students are reported missing, but then a film is discovered on the internet that suggests they have ritually killed themselves. For Detective Inspector Damen Brook of Derby CID the question is, are they connected? Why did the students want to die when they had such bright futures ahead of them? Is the film a fake? As the body count rises, Brook must piece together a sequence of events that gets ever darker and more terrifying. And when his own daughter’s life is threatened, Brook must employ everything he has ever known to uncover the truth before time runs out . . . It is to my shame that copies of Steven Dunne’s previous DI Damen Brook novels ‘The Reaper’ and ‘The Disciple’ sit on the shelf behind me, as yet unopened despite having been in the house for a long long time. When DEITY hit the doormat, however, coupled a fine review by Stephen Booth to accompany the book’s release, I could not wait to get straight into this new title – something that has ensured that I’ll be checking Mr Dunne’s back catalogue as soon as I can now. Haunted by The Reaper case and now living in Derbyshire, after relocating from London, DI Damen Brook is an old school cop in many ways – even his mobile is a basic model for which only his closest colleague DS Noble has the number and which he can barely use to take photos and make calls. Thrust into the two cases of apparent murder of vagrants and disappearance of students, Brook struggles to keep up with the technology which the victims and the possible perpetrators of the crimes are using to tell their stories online, caught in a world in which celebrity, fame and notoriety are monitored and updated at the click of a button. The use of a website ‘DEITY’ to provide updates on the missing students via film footage is no more than a terrifying further step in the wrong direction from ‘happy slapping’ and the author handles it superbly, frighteningly, well. Deity is a sprawling tale which takes in many themes and aspects of our modern culture, serving as a lesson that it really does pay to be careful what you wish for, particularly if what you wish for is to be as famous as the ‘live fast die young’ icons who adorn many a teenager’s bedroom wall. The concern that whoever is dumping mutilated bodies of the homeless may only be working on getting something right, experimenting with a plan, made me think of Mark Billingham’s excellent ‘Sleepyhead’ in which a killer was dumping the ones he got wrong, and in DI Brook, Steven Dunne has a character that deserves every much as much success as Billingham’s Tom Thorne. The group of students within the tale are a great group of characters, each with their own baggage and reasons for wanting to disappear, and this book is pretty mammoth in stature as a result to fully round out their characters and backgrounds – but I never felt it was overstaying its welcome. The references to movies, particularly to ‘Picnic at Hanging Rock’ and the ‘Time to die’ quote from ‘Blade Runner’ as well as mention of the found footage style of ‘The Blair Witch Project’ when referencing the film found of the students here is all very well played and serve as great points to hang the narrative on, and make the story even bigger by their inclusion. The literary reference which is used by Adele Watson (one of the students) ‘A dream within a dream’ from Edgar Allen Poe, which is also a line from the intro of ‘Picnic at Hanging Rock’, serves the book best as reading it feels just like that, a darkening dream where you are just not sure where reality is playing out and are caught along with DI Brook into questioning every event, every step of the way. Deity has a real sense of escalating tension, of impending doom, like scaling a creaking staircase in a haunted house or descending into a darkened basement – You know it’s going to be bad, but on you walk. By now you’ll know that my life as your son is over. It gives me no pleasure to think of the pain that statement causes you. I wish it caused me the same pain but I have to confess that it doesn’t. The lifetime of disappointment, that awaits everyone, came early for me and I’ve decided not to put up with it. I’m sure you’ve noticed how unhappy I’ve been since I told you I was gay. I also know it caused Dad even more pain and that’s why he left us. He was ashamed and embarrassed to have me for a son (don’t bother to deny it). Let me stress, mum. I am NOT ashamed of who I am and this is NOT an apology for my (God-given?) sexuality. But since the thunderbolt struck, I have felt that my life in a boring town like Derby could never be happy because it’s a place where there’s no room for somebody different. I’ve seen the way people look at me and whisper to their companions when I walk by. When they realise I’m gay they treat me like I’m insane and, worse, diseased. To them I’m some kind of criminal, a pervert – as if I chose to be what I am and, if I tried harder, I could avoid being attracted to boys by an act of will. I know this is very sudden, mum, and what must hurt the most is not saying goodbye. I wanted to but knew I couldn’t because you’d try and stop me which would solve nothing. It’s sudden for me too but my mind was made up when a person I truly cared about, and thought cared about me, rejected me. Since that moment, I knew I had no future in this place and I decided to make the journey to a better one. You’ll know now that others have made the same journey with me, not misfits, as I’m sure the TV and papers are saying, but friends who think like me. It’s the world that doesn’t fit, mum, so I’ve taken this chance to show other unhappy souls there is a way out, a way to take hold of their destiny. I love you mum. 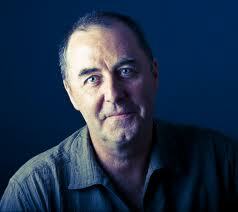 Goodbye Len. Look after mum. P.S. Watch Picnic at Hanging Rock. It will explain everything. Read DEITY and, like me, you will want to rush out and track down a copy of Picnic at Hanging Rock. 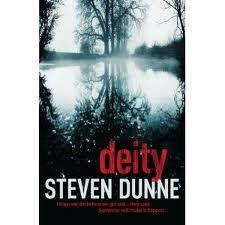 Read DEITY and, like me, you will also want to grab Steven Dunne’s other books. Some final words of warning – it’s not often that a book causes me to rise from my bed at midnight and make my way downstairs to read for another hour after already deciding to wait until morning. It’s also not often that I read the first 100 pages of a novel and then stop to wonder if I have even paused to blink – I don’t think I did. A firm highlight of my 2012 reading to date. I have a copy of this (sitting on my shelf) and I now feel inspired to read it. I love ‘Picnic at Hanging Rock’ too. I will push the book up my (very long) reading list. I loved Picnic At Hanging Rock and I’m a sucker for an old school cop like Tom Thorne so I think DI Brook might be ideal for me. I’ll add DEITY to my What Next list and after your review I’ll look forward to it!